>> Over 3,000 jobs are posted annually for LTU students and graduates. >> LTU is a national leader in STEM education. Students benefit from a theory and practice approach and an 11:1 student-faculty ratio. >> Over 4,500 students are enrolled in LTU, representing 37 states and 47 countries. 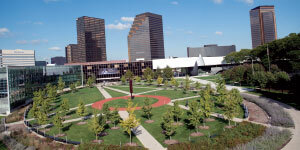 >> LTU’s high-tech, wireless 107-acre campus is commuter friendly, with recreation, housing, and meal service options. >> Students are provided their own high-end laptop loaded with industry-standard software—retailing at over $75,000 on average—a benefit they’ll only receive at LTU. 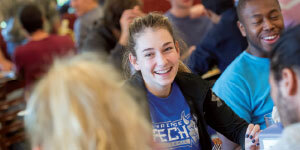 >> Lawrence Tech offers a dynamic campus life, NAIA sports, and leading-edge programs in architecture, design, engineering, science, business, and applied technology. >> Co-ops and internships abound at LTU, giving Blue Devils the skills that make them indispensable to their industries and earning them some of the “highest alumni salaries in the US,” according to PayScale. >> The average starting salary for LTU grads is $54,700, while the mid-career salary is $102,300, according to PayScale. >> Over 300 companies visited LTU’s campus to recruit students in 2017–2018. Many programs are available in the evenings or online. For a full list of master’s and doctoral programs, visit ltu.edu/academicsandmajors. Lawrence Technological University is a private, 4,500-student university that offers more than 100 innovative programs in the Colleges of Architecture and Design, Arts and Sciences, Business and Information Technology, and Engineering. As an ambitious, talented student, you will appreciate small class sizes taught by faculty with industry savvy and an exceptional focus on theory and practice. Once here, you’ll see why Lawrence Tech is ranked among the nation’s best universities by U.S. News & World Report and The Princeton Review. With a degree from LTU, you can position yourself as a high-income earner. The Brookings Institution ranks Lawrence Tech fifth among US colleges and universities for boosting graduates’ earning potential. Not only that, PayScale.com reports alumni salaries are in the top 5% nationally. Some 86% of students are employed or grad school bound by graduation—above the national average. You’ll also benefit from the University’s location in the dynamic suburb of Southfield, Michigan, with hundreds of Fortune 500 and international companies nearby. 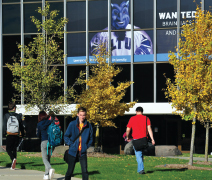 LTU’s unique location provides opportunities for co-ops, internships, and professional development in a region with one of the largest concentrations of engineering, architecture, and technology jobs in the world. LTU offers remarkable hands-on experience with projects, competitions, and applied research partnerships. You may enter a variety of intercollegiate competitions that focus on the design and/or construction of supermileage vehicles, electric motorcycles, and Baja vehicles. If going fast is your thing, the Blue Devil Motorsports teams design, build, and race Formula-style vehicles. Lawrence Tech also promotes global experience with a study abroad program that includes partnerships with universities in Asia, Canada, Brazil, Mexico, Europe, and the Middle East. LTU’s fourth residence hall opened in 2018, featuring the latest in green technologies and a design that focuses on community engagement. Over 1,000 students live on campus and enjoy an expanded dining center with healthy food options. Utilities, Wi-Fi, basic cable TV, and parking are included in residence hall fees. The University also offers more than 60 student clubs and organizations, including fraternities, sororities, honor societies, and student chapters of professional groups. New labs have been added in robotics, engineering, and biotech.